In Houston, sprinklers are a must have. With our hot sun, unpredictable dry spells and long summers, your lawn doesn’t stand a chance without a little extra help. Only with consistent watering will you achieve the lush, green lawn we all crave. But if you’re like most homeowners, you hate watering the grass. Who wants to struggle in the hot sun untangling water hoses and dragging around bulky sprinklers, spending ages in trying to position them at just the right angle so that the water reaches all of areas of your lawn? With an inground Houston sprinkler system, you can check that chore off your Saturday list for good. For irrigation Houston homeowners can rely on, Total Lawn Care installs the best sprinkler systems on the market. We rely on Hunter and Rainbird systems for their superior quality, ease of use, automated options and green technology. No more wasted energy or water flowing down Houston drains. Our sprinkler systems utilize the latest irrigation technology to water your lawn efficiently. Our installation crews are experienced irrigation experts and will lay your system to allow for maximum coverage and minimal water waste. 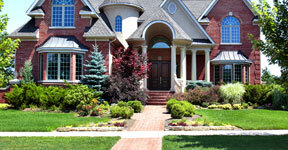 In addition to irrigation, Houston homeowners also rely on Total Lawn Care for drainage solutions. Excess water can create many problems around your property, including cracks and damage to your foundation and impaired growth of your lawn, trees and landscaping. Often excess water gets trapped in low-lying areas of the yard, creating an unsightly breeding ground for mosquitos and other pests. From diverting excess run-off water to laying extra drains and regrading the slope of your lawn- the drainage experts at Total Lawn Care can solve all of your Houston landscaping drainage problems- large or small.